1955-1970 Ford Cars: Galaxie, 500/XL, LTD, Crown Victoria, etc. Ford Mustangs and T-Birds have always been in the spotlight, especially in the 1950s and '60s, while millions of Galaxies, Fairlanes, 500/XLs, LTDs, Crown Victorias and other full-sized Fords quietly toiled away as basic forms of transportation. And while most of them were all about creature comfort and style, many full-size high-performance Ford cars made history in competition. 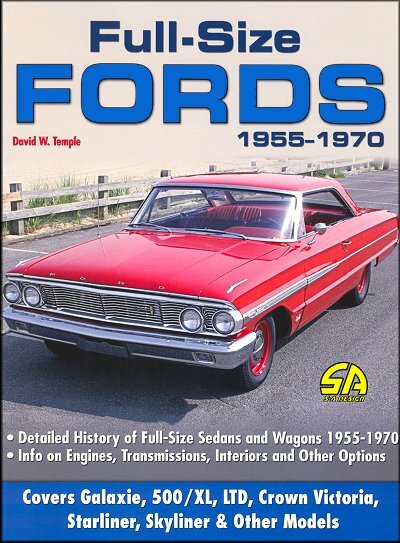 In Full-Size Fords 1955-1970, automotive photojournalist and author David W. Temple, offers a fascinating chronicle of all these cars, covering topics such as the design process, equipment packages, trim options and interior patterns, even paint codes. In essence, all full-size Ford cars form 1955 through 1970 are revealed in complete detail. This book is a must-have resource for the Ford car collector or enthusiast. Ford completely redesigned the body of their big cars for 1957, rather than perform a heavy rework as they did the 1955-56 models. Styling was based in part on Ford's show car, dubbed Mystere. From front to rear, the 1957 big Ford's styling was clearly inspired by the lines of the show car, especially the fins, though in a subdued fashion. David W. Temple is a freelance automotive photojournalist specializing in the vintage car hobby. His articles have appeared in many magazines over the past 2 decades. This is his second book. A Note About "Standard" and "Not Available"
Ask a question about Full-Size Fords 1955-1970.